Deb Day has been teaching English and reading classes in northeast Iowa since 1989. In her current position she teaches speech, creative writing , ninth grade English, and coaches contest speech. She is married, the mother of two, grandmother of six, and is owned by Chloe, a one and a half year old Golden Doodle. All of this provides plenty of material for her blog about teaching and her life called Coffee With Chloe. When Stacey emailed and asked me to do a guest post, I was flabbergasted! Did she even have the right person? I haven’t written a book or presented at a conference. I wrote a little blog about my life and teaching. But Ruth and Stacey write about being a teacher of writers instead of a writing teacher. In my blogging journey, my view of writing changed and so has my view of teaching it. If you are going to guide writers, then you have to write yourself. I’ve taught creative writing for a couple of years now. The first semester I taught it, I made assignments, gave due dates, graded papers and moved on. We did a lot of sharing that year, which was good, but we seldom revisited anything once it was graded. It wasn’t what I wanted my writing class to be. The reflections of the class revealed that many of my students wanted to be able to choose what they wrote. More freedom. So the next semester, that’s what I did. Students needed to have eight published pieces by the end of the semester and compile them in a portfolio. But what they wrote, when they turned them in was up to them (there were date guidelines, but nothing specific). How naïve I was. 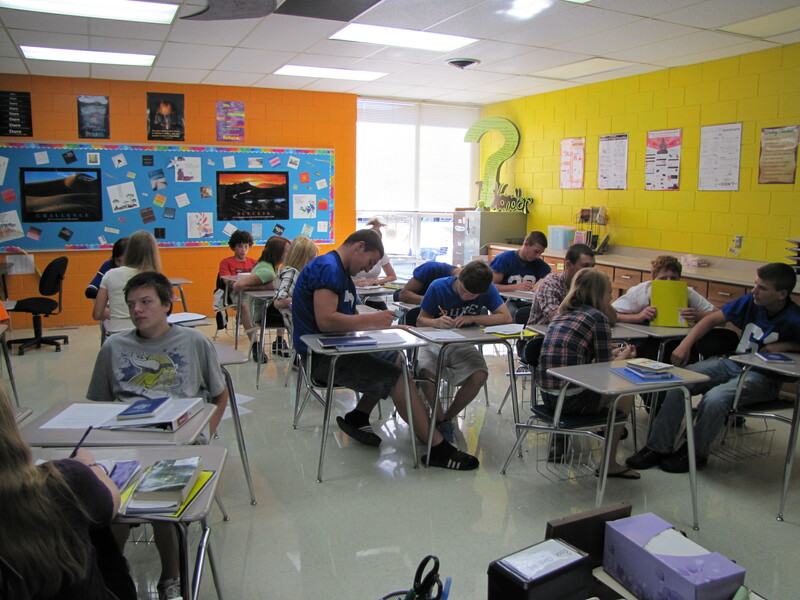 The day of the semester final, I had students sitting in my classroom frantically writing. Not what I envisioned. Specific due dates were definitely needed! So were numbers of specific genres. Creative writing continues to evolve. By the time this posts, I will have been in school for two and half weeks and I’ve been working and revising my writing classroom. There are things I would like to do, but can’t (cozy furniture or antique writing desks would be great to create the atmosphere! ), but there are plenty of things I can do to help my writers in their journey. I’ve created a writing corner in my room. I filled the drawers with fun paper to draft on. There are lots and lots of pens and markers to doodle with. There are staplers and paper clips, tape and glue. A rotating book rack holds grammar books, various kinds of dictionaries, and books about writing. A file box with directions and ideas for writing is also on the counter. There are also example pieces of writing from last semester’s class hanging around the room. I am lucky that I have a computer lab in my room that no one but me really uses. The first writing I always have students do (and one of two they don’t get a choice about) is a writing autobiography. I’ve adapted this from many places and don’t even remember where I first learned of the idea. I give the students a sheet with directions and a few guiding questions and turn them loose. It usually takes them about a period and a half to complete the assignment. I don’t grade it, but I do give them points for completion. I’ve used it with seventh graders and I’ve used it with seniors. It doesn’t matter grade level. I like it because it gives me great insight into the minds of my new writers. It also gives me ideas for the first mini-lessons of the year. Two areas I want to concentrate on this school year are writer’s notebooks and sharing. I don’t believe I did any justice to either this last year and I need to correct that! Writer’s Notebooks: I have always said I used writer’s notebooks, but really, they were just journals. It wasn’t until I began my own notebook in earnest that I realized what I called a writer’s notebook was just a journal. I began the transformation last semester but this year, we will work on/in them in earnest. I began this semester by showing them my writer’s notebook and what I have been including in it over the summer. 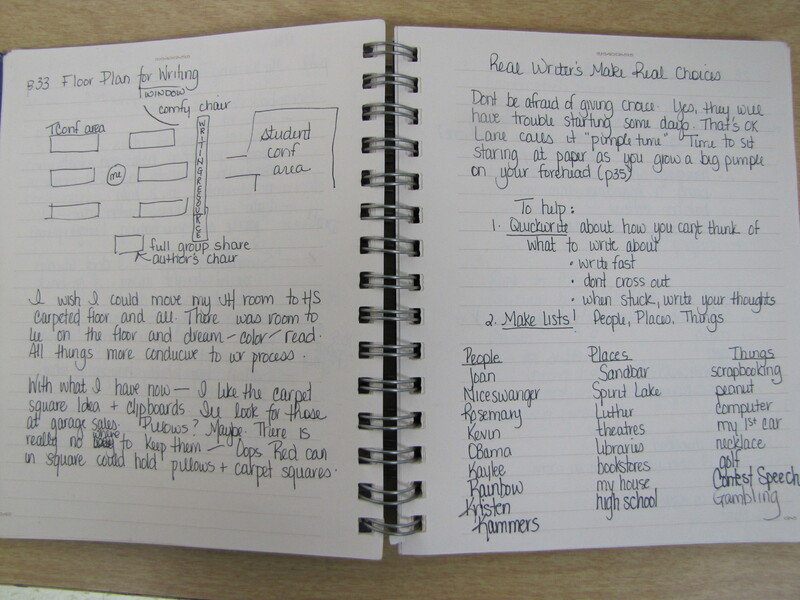 Once we have looked at mine, we made a list of what they found and other things that could be included in the notebook. I typed it up and everyone taped it into his or her notebook. We’ve been doing little activities in the notebook that will help them with ideas for writing. Most of these activities I took from Barry Lane’s book But How Do You Teach Writing? A Simple Guide for All Teachers. I also fill them in on new things I include as I write them down. It’s good for them to see that I keep adding things even though my current notebook is almost full. This year, more of my mini-lessons will involve teaching a genre and then trying it in their writer’s notebook. I have required different genres of writing in the past, but I relied on a written set of directions to guide students. I really neglected teaching the genres last year and consequently was disappointed in some of the writing I received. Sharing: While students sometimes share amongst themselves, I haven’t included as much whole class sharing as I would like. This year I want to share more and in several different ways. A favorite with past students has been the “silent share.” I’ve noticed students seem to have trouble sharing their writing aloud. So in silent share, I have students lay out their writing around the room, with or without their name. The class then goes around the room with post-it notes and reads at least three pieces. They write their comments on the notes and stick them to the piece when they are done reading. Gradually, as students become more comfortable with each other, I will work toward more public sharing of drafts and snippets of long pieces. I also need to do more sharing of my own work. Students need to see the struggle of writing (the drafts of this posts will make great mini-lessons). They need to see the process I go through as I write. They need to see my revision process, my editing, my successes and failures. They need to see a writer. But the utensils, the modeling, and the sharing won’t make them better writers. Writing will. Thank you for accepting this challenge of a guest blog post. To read that someone else is still experimenting, changing, and improving their classroom practice is comforting. You set a good example on how to be a reflective teacher and a teacher who writes. I hope that you and your students will have a year full of learning, challenge, and fun. I know you were apprehensive about sharing in this forum, Deb, but I’m so glad you did! Deb, great post and what an awesome reflection! What worked, what didn’t, what needs to be changed or improved. So many great ideas and your students will benefit greatly from your knowledge, experience, and reflective practices. I think you are right — kids need choice, but there also needs to be a bit of structure and guidance. I love the “silent share” idea as well. We know how difficult it can be for us to open up and share our writing, imagine how these “kids” (yes, they are still kids!) feel! Thank you for taking a step outside of your comfort zone and sharing the great work you are doing! I agree with everyone, you have written a great post about your journey and many of us can relate to what you have experienced. Something that caught my attention was you said when teaching genre you gave kids a written set of directions for the genre and their results disappointed you. This reminded me that Katie Wood Ray said kids need to see examples of the the genre from the “real” world before they can produce writing in that genre. From these examples you can create a list of characteristics of the genre. This becomes an inquiry approach to teaching genres. Thanks for your honesty and willingness to share. Looking forward to more from Coffee with Chloe. Thanks everyone for your very kind comments. This was the scariest share I have done! I have been neglecting the Tuesday slices lately. Summer travels got me out of the habit and a need to feel more guarded has prevented me from picking it up again. Your post reminded me that I miss the slicer community. I loved the literal glimpse into your classroom through pictures as much as the reflection you shared through your words. You are clearly inspired and that makes you inspiring! Love the silent share, Deb. I really enjoy reading about your reflections on your teaching. I agree with Tam about you “being on fire.” I love the honest voice in your writing. Thank your for this post. You are so reflective about your teaching of writing. I agree that if you teach writing you, the teacher, need to write and share. Enjoy a new year of exploring and writing. You are so right about that last point…and how lucky for your students that you, now a writer yourself, will be there to guide them through the process. We, too, spend those first weeks just on the writer’s notebooks. One of my all time favorite books for this is Ralph Fletcher’s “Breathing In, Breathing Out” (http://www.amazon.com/Breathing-Out-Keeping-Writers-Notebook/dp/0435072277). Many of my early mini lessons are based on the ideas he presents in this wonderful guide. Thanks for sharing, Deb…it looks like your year is off to a great start! Deb, you have nailed the issue for all teachers of writing with this posting. The vital message is that as teachers we must participate fully as writers ourselves. Sharing our personal journey as writers, sends such a powerful message to students. We must value what we are asking them to do. A great message to share. I see the school year being filled with great discoveries for you and your students. How exciting is that? Deb, I loved hearing more about what you do in class with the writing, especially that you are using more writers notebook work with the students. I hope you share more later about how it’s working. This post was delightful to read as you showed us the process you’ve gone through these past years, down to what you’re aiming for this year. Finally, I really liked the idea of using the autobiographies as starters for your mini lessons, a very personal touch! Thanks for all. I am a pre-service teacher taking my writing methods course this semester. 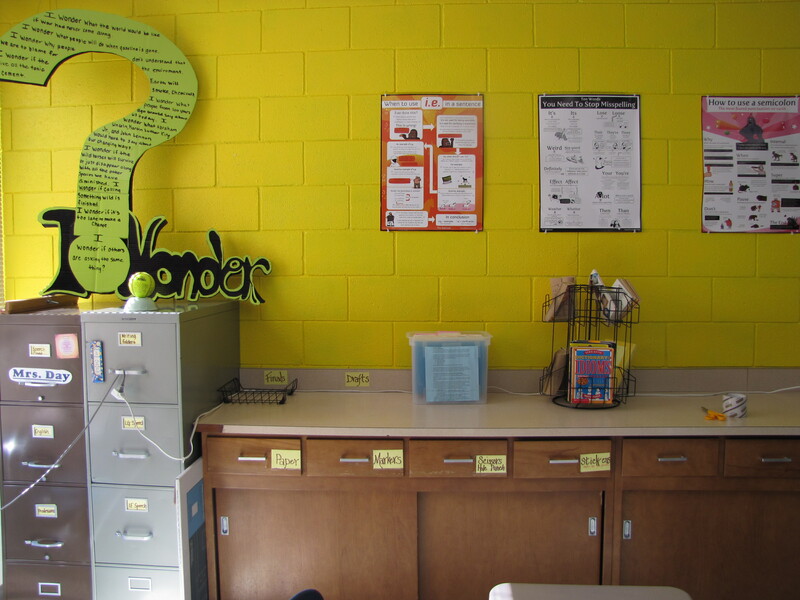 I absolutely love your idea for “silent sharing.” That is an idea I will unabashedly steal for my classroom! Wow! Deb, you’re a self-taught writing workshop coach! I went through the same type of activities that I learned from writing coaches and workshops. It seems like you’re sold on this type of writing as I was–it kept me going and positive through the tough times in a classroom. I also had 7th graders compile their work in a classroom binder from which they would take all their work at the end of the year and make their own “published books.” Not even the weakest student wanted to leave their “book” behind–I felt like I really accomplished something every year. You’re on fire, Deb. I enjoyed reading about your growth as a writing teacher. I just wish I had learned this long, long ago!